I am pleased to have been invited to deliver the keynote address at the upcoming MPF 2014 Leadership Conference, to be held in Atlanta on May 8. My remarks will focus less on the challenges posed by the economic and structural disruptions facing the legal profession and more on the compelling opportunities such changes present. 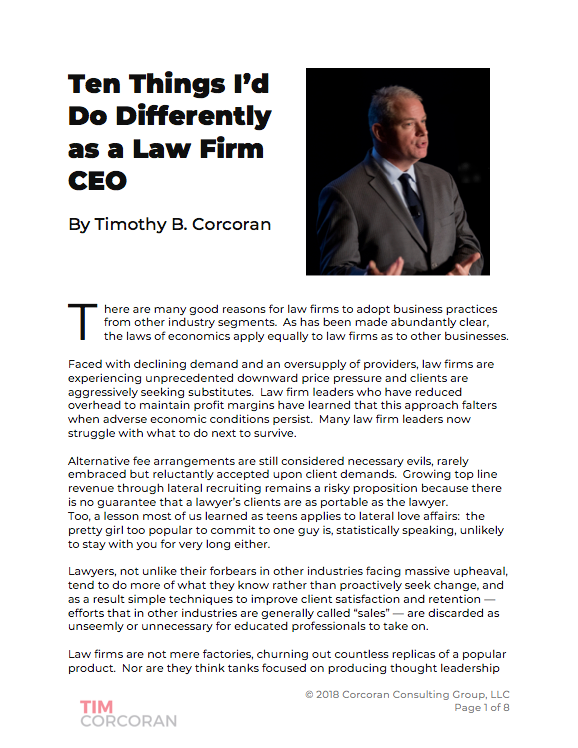 Believe it or not, there has been no greater time for quality lawyers and law firms to stand out in a crowded market and thrive while others languish. I not only believe this, I believe we can demonstrate it, clearly and concisely, illustrating the mathematical link between increased client satisfaction, law firm profits, and the quality of legal services. It's quite possible to improve performance on all three fronts simultaneously. The most common lament I hear in my consulting work with law firms and law departments alike is that this inexorable shift from law as a profession to a business is troubling; and this increased focus on ROI and profits -- whether by lawyers seeking ever-increasing compensation, or by business leaders seeking to control costs -- is chipping away at the nobility of the profession and turning it into a crass commercial endeavor. Some fear that lawyers who have spent years delivering quality legal work to satisfied clients are now being forced by reduced rates to choose between delivering a lower-quality work product to maintain their lifestyles, or hold steady on quality but face significantly reduced compensation. The increased prominence of bean counters, or procurement functions, in the purchase of legal services proves that cost is more important than quality. To this I say: Really? Are you under the impression that clients have heretofore been completely satisfied with your work and your rates? Do you believe that businesses hiring you in the past were primarily concerned with the expansion of the rule of law as a noble societal goal rather than furthering their own commercial interests? For those working in-house, do you recall your CEO asking you to eliminate all business risk, and take as long as you'd like, and spend whatever you wish to achieve this outcome? The first lesson is that nostalgia ain't what it used to be. The second lesson is that there are fundamental business techniques to guide law firm leaders from the darkness and into the light. While these challenges may be new to the legal profession, they aren't new challenges. And there are answers. Law firm leaders face unique challenges: How to herd cats; how to reconcile firm-wide strategy with compensation plans that tend to reward individual behavior; how to invest for growth in the face of declining revenue; how to attract and retain star talent; how to make tough business decisions while having a heart. We'll discuss these challenges and more. I'm confident you'll leave with answers to your questions. I hope you can join us. The MPF 2014 Leadership Conference is produced by John Remsen, President & CEO of the Remsen Group. Since 2002 more than 825 law firm leaders from 700 firms in 41 states have participated in 22 MPF conferences held throughout the US. They value its high-level participants, its interactive format, and its world-class faculty. Click here to read some of their testimonials. Click here to register.